Christmastime is here! Long time readers know Christmas is a really big deal in our house, we go all out with a big party for our friends and family each year (we’re talking 100 peeps!) and so the decking of the halls has begun! Having recently painted the living room Rockport Gray, I started this year with the mantel. I love mixing metallic sheens and layers of white so I’m at it again. This year’s mantel is a merry and bright winter scene complete with a dash of sparkle and a bit of green. I reused my ancient mixed metallic wreath again because I love it so. I bought it at Target six years ago and it always ends up somewhere (see it here and here in Christmases of yore). Glitter tape dresses up a plain vase filled with light up branches and sit next to my favorite pair of reindeer. Our Pottery Barn quilted stockings are hung with simple ornaments to embellish. The French doors that lead to the space are now painted black and I love them! They play well with the piano and add a sophisticated touch to the room. I like to plant or place things in unexpected vessels… a coffee cup for ornaments, a shadow box for a metal snowflake, and a silver gravy boat for a succulent. A bottle brush tree forest on a cake stand ? Sure why not. I mix a lot of faux and fresh, fresh and faux, there are no rules really. The white trees that sat on the front porch last year sit next to the fireplace instead. I swapped the nailhead club chairs that sit in this space for the low back pair from our master bedroom for a slightly different look, the Essex rug is from Z Gallerie, the gold candlesticks from CB2. My boy set up his Polar Express a few days ago as I was adding the final touches and I insisted he leave it there until January because what is Christmas without a boy and his train, I ask you. I’ll be adding a few more holiday touches to the house over the next week or so and will share them soon ! Great space, Kate. Love those CB2 candlesticks- they remind me if the ones I saw in the dwell studio holiday catalogue, that unfortunately were very expensive! thanks for the holiday inspiration! So pretty! I love the gray with all the metallics. Lovely! Now I’ve got that song in my head too! Where is the gorgeous rug from?? Your home is fantastic and brimming with inspiration as always Kate! Love your new paint color too, can’t wait to show you the DIY wrapping paper wreath I made with your Ribbons Olive and Moss paper! What a gorgeous space! It’s like a winter wonderful. So beautiful!! Swoon!! Absolutely GORGEOUS!! I love the mixed metallics & the pops of green! Perfection!! It is amazing! i love the unexpected accents! The color scheme is also amazing. You have done it again. This look is to die for. Sooooo elegant! And beyond the Christmas decorating, I will be painting my bedroom Rockport Gray. I’ve been looking for the perfect grey and seeing this on your walls I know I’ve found it. Fantastic job with the room! This looks so pretty and sophisticated! You are such an inspiration! Absolutely gorgeous! I do have a question though – I noticed a white poinsetta, and I know you have a kitty. I have cats too and I have always been afraid to put out a poinsetta (even though I LOVE the look of them) because I’ve heard cats are allergic. Is yours faux? Or have you had any issues with a real one with your furry friends? Thanks for any advice! GORGEOUS! Love every bit of it! The train is a nice festive touch as well. Our American Heritage Troop went to a model train day at a friend’s home on Sunday and we had a great time and were educated about the different trains and equipment. Very fun!! I have gone the way of white and metallics this year with pops of red. I love how it looks so clean, but really brings out the punch of color for an added festive feel. I love how the green looks with your colors. I am in love with this! Looks amazing! I love the mantle- that is the color scheme I picked this year – mine doesn’t look as fabulous as yours does though. It looks beautiful!! You are always an inspiration! What a wonderful space you have created! I love the simple quietness of this room and it will be expecially nice when the holiday season starts to get crazy :) Thank you for such a lovely post! As always, looks fabulous. Can you please tell me where the round side table is from? I love that you had him leave out his train for Christmas! So beautiful. What a beautiful room and mantle! I am planning in doing mixed metals for my decor this year and you are giving me some great inspiration! Love the beauty and the fun in the room! I have always had a hard time finding solid color wrapping paper (without spending a huge amt)…..where did you find yours? This year’s look is stunning – as usual! Breathtaking! Love the icy fresh decor. I, too, fill a mug with Christmas balls on a tray beside an armchair – it looks styled, but says someone lives there, too:). So elegant! Loving the toy train under the chair! classic, chic, gorgeous as always! Love it all….but I’m especially encouraged and inspired now to paint my walls grey. I was worried the colour would clash with my sofa and chairs (natural linen colour) but now think it will be fine. Love it! It’s so simple and sophisticated! I decided to forego my usual red-and-gold decor for mixed metallics this year too. There’s something about that color combination that makes me feel very glamorous! I think I just found my colour scheme for next Christmas. Thanks for the inspiration Kate! I love mixing metallics. The whole color scheme being overall white looks like new fallen snow. Very striking! 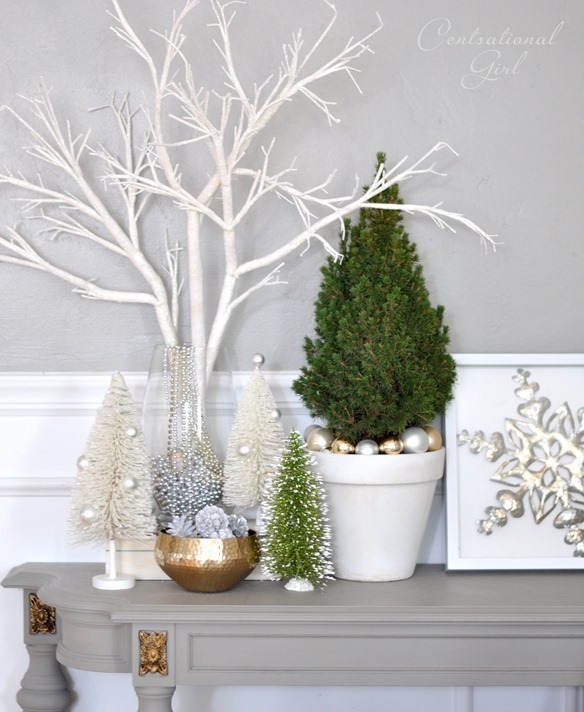 I absolutely love the gray on your walls and the white and metallics for the holidays. Lovely room! I look forward to seeing more. Beautiful mantle. I love the train and it looks great where it is. You are a great Mom. Mixing white with gold and silver looks so modern and elegant. Thanks for inspiring us! I love your arm chairs which look stylish and comfortable. Would you mind mentioning where you got them from. Thank you. They were a Joss & Main find Lisa from last year, they always have club chairs that go on sale, that’s how I snagged them! Absolutely beautiful! I also love mixing metals (doing that on my mantel this year as well). The wreath is adorable…..I bought the multicolored like it this year. Looks great on my turquoise front door! It’s gorgeous Kate! You have impeccable taste. I love your son’s train. We have a train set that belonged to our great grandfather that we put up each Christmas. Wow! What a beautiful room! Love, love, love it! Well done! Looks gorgeous and I love the train! Thanks for the link to Michelle Dwight…I clicked over and ordered a pillow cover. I love the reindeer! Where are they from? Would love to know where you found the white Christmas trees in the urns. LOVE them! This is beautiful I was wondering what you use to prop your trees in the urns and keep them upright. Thanks! ^^ I’m with cristin! Where are those awesome reindeer from? Everything looks so lovely! Love everything!! Thank you for sharing! Do you mind sharing where you bought the white reindeer pair? Thanks again and happy holidays!! Hi Sandra, the reindeer came from a local shop, I use them every year! Truly enjoyed touring your home. Thank you for sharing it with us. I’ve become a new follower on Fb and Pinterest as of now. I loved your little and affordable ideas…the decorations hanging over the top of the stockings…definitely copying that idea. Wow, this is fantastic! It has such a calming feel too it – I want to come sit in your living room right now! I think the mix of the gray and white is perfect. Love the color combo :) Just beautiful! Where did you get those darling chairs? Love them! Hi Kate, the walls look great in Rockport Gray! Love it, and all the beautiful Christmas details you set up, it’s GORGEOUS everywhere as usual! your space is just beautiful! I love he contrast of the white and crispness against the grey. So pretty! I’ve always thought that a home looks better when it’s colorful, but this post of yours proved me wrong. I love it looks with white, gray and metallic. I love the new gray paint! The entire room is like a chic winter wonderland! Simply beautiful Kate. I could stare at the pics all day!